If your organization seems to be stumbling through the strategy process, you may need to look past your strategic planning task force to engage EVERYONE on the team, not just a few core leaders. It’s more common than you think, a program has been operating since the organization’s founding and no longer commands the same respect and support in the community that it once did. Funding and attendance are down, but the board can’t see the red flags. When a program is deeply embedded into the identity of an organization’s history, the time and energy required to refocus can seem daunting. Doing nothing, however, can potentially lead to the organization’s eventual demise. We believe this scenario can also be a seminal moment for an organization – an opportunity to bring everyone together and launch an exploration of all aspects of the nonprofit, from questioning the fundamental value of programs and desired outcomes to understanding and communicating the costs of delivering impact. The Alliance for Nonprofit Excellence (the Alliance), a capacity building organization that provides resources, training and consulting services, and helps to build operational excellence within the nonprofit sector of the Mid-South region of the United States, recently had this moment. Working with Spectrum they seized the opportunity to create a strategic orientation, a more holistic approach to strategy that engages the full board and broader community in understanding needs, asks hard questions, and identifies strategies for impact and the revenue streams necessary to sustain them. “Spectrum was supposed to just take us through the matrix map model, but that ended up being only a small piece of what we did together,” said Nancy McGee, CEO of the Alliance for Nonprofit Excellence. An analysis of the Alliance’s programs showed fewer people attending program events over time and each one operating at a deficit. One particular program, which had been in operation since the founding of the organization, was running a nearly 50% deficit. Furthermore, it no longer represented the impact the Alliance sought to have in their community. It had been this way for some time, but the analysis “was an eye opener for the board,” recalls McGee. The pathway forward was unclear for the organization but the board “knew [they] couldn’t continue on this way.” That’s when Nancy engaged Spectrum Principal Steve Zimmerman. Something had to change, and it would require more than just the Alliance’s leadership team to figure it out. The Alliance was in flux. Attendance and revenue were declining, raising a key strategic question around community impact and the value the Alliance brought to the Mid-South region. Initially the strategy task force was comprised primarily of board members, but to better understand the Alliance’s role in the community they needed to reach beyond internal stakeholders to speak with funders, staff members, and other community and sector representatives. With Steve’s guidance they began a series of funder and external stakeholder interviews. “It was one of those ‘a-ha’ moments,” says McGee. Spectrum and McGee collected external perspectives from more than 60 community representatives and funders on the changing needs of the region and discovered the perceived disconnect between many of the Alliance’s programs, their internal structure, and the impact the organization could have in the community. Spectrum Principal Steve Zimmerman took this information directly to the board, but he didn’t stop there. “Steve was very helpful in pointing out how things were out of alignment. He was able to help us zero in on the dysfunction that was going on and the realignment that was necessary,” recalls McGee. And how the organization could navigate the process of realignment. Spectrum’s market analysis enlightened board members with perspectives from additional funders and community members and helped the board identify those areas where the Alliance was perceived to have strength and where there were threats to its current business model and reputation. Drawing on national research of similar organizations, Spectrum also presented a variety of potential models for the Alliance’s future structure. 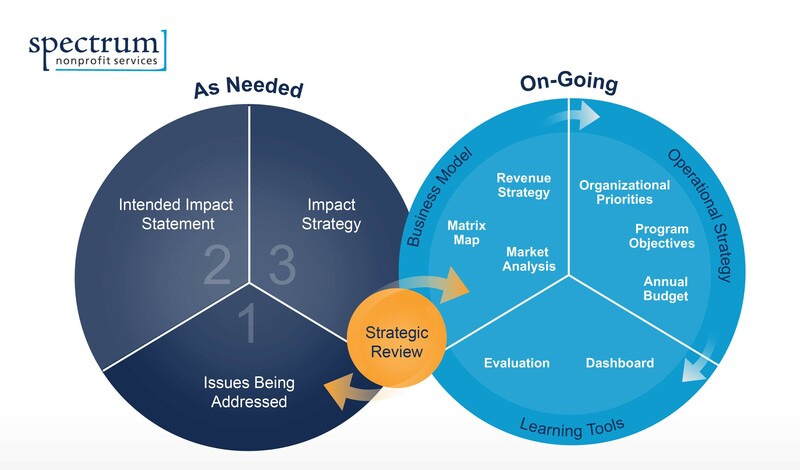 Using Spectrum templates, board and staff worked together to refine their impact strategy which is currently featured prominently on their website, and conducted their own matrix map process. Subsequently, Spectrum worked with senior leadership to realign the Alliance’s programs, staffing, and community relations and evolve the organization to meet the needs of the region. A substantial realignment of resources away from the longstanding program, including the elimination of a full-time position. A renewed focus and organizational shift towards a more cohesive model for nonprofit capacity building – one aligned with the best national research but reflective of local needs. A regional nonprofit sector advisory council. Today, Nancy McGee says that the Alliance is still implementing the changes that came out of the strategy process two years ago. There is no specific timeline; rather, the organization continues to think through strategies, learn from implementation and make changes to better meet needs and opportunities as they arise. They are also focused externally, meeting with regional political leaders, convening groups around community issues, and “trying to build bridges between nonprofits, funders, government and businesses” to get people to recognize that “the nonprofit sector is a sector that provides very important work and has an impact on our economy.” The newly founded Nonprofit Advisory Council meets with the Mayor of Memphis on a monthly basis. For more information about the Alliance for Nonprofit Excellence, visit their website.